Lock in a great price for Hôtel Ellington Nice Centre – rated 8 by recent guests! Professional staff, superb breakfast which is a great deal, pretty building, comfy bed. Great location, walking distance to the old city and the beach boulevard, our pet (large dog) was welcomed. Good breakfast, easy parking close by. Very good location! Close to all amenities and most attractions within walking distances! Breakfast was decent, girl working in bar was nice and friendly. The bed was very good and the room was kept clean. A nice patio. Location, hotel design, breakfast and very helpful and nice staff. 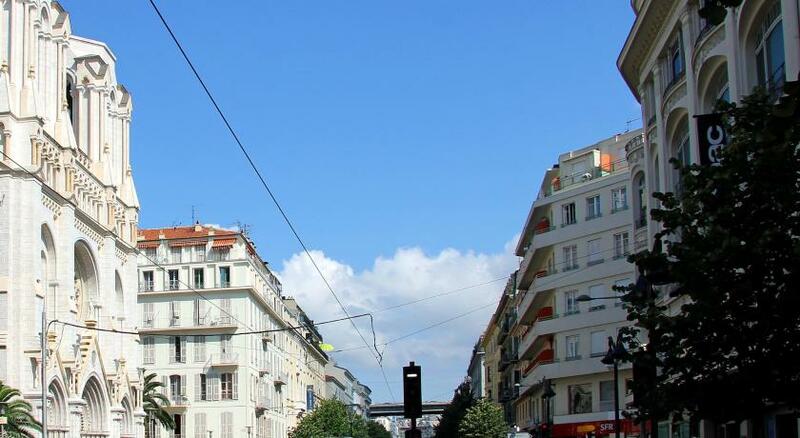 Located in Nice city center, 0.6 mi from the beach and the Promenade des Anglais, Hôtel Ellington offers free WiFi access and a 24-hour front desk. 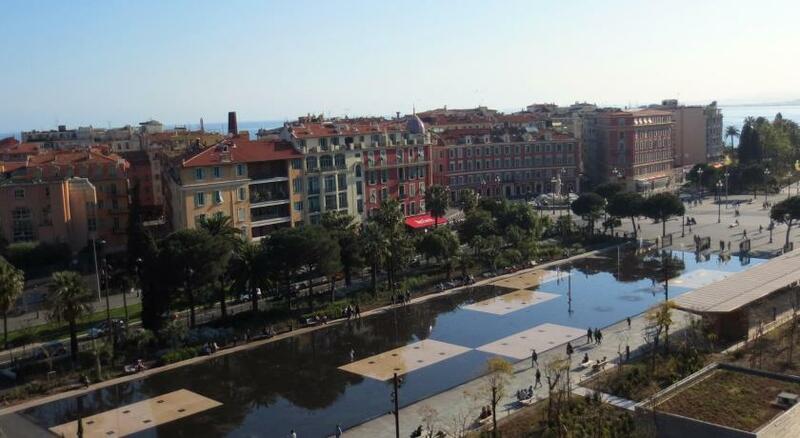 This property is 2,150 feet from Place Massena and from Promenade du Paillon Park. All the air-conditioned guest rooms offer a contemporary décor and are equipped with a flat-screen TV, electric kettle, safety deposit box, mini-bar and desk. The private bathroom has a bath, free toiletries and a hairdryer. A buffet breakfast is available every morning in the dining room, and can be taken on the terrace upon request. The lounge bar is built in an early 1920s style and has the original tiles, a marble fireplace and collectible items. The hotel décor honors Duke Ellington and was inspired by the jazz music of the 1940s and 1950s. It features a black and white picture gallery of singers and actors. The outdoor patio has a Statue of Mercury and is furnished with wrought iron furniture. 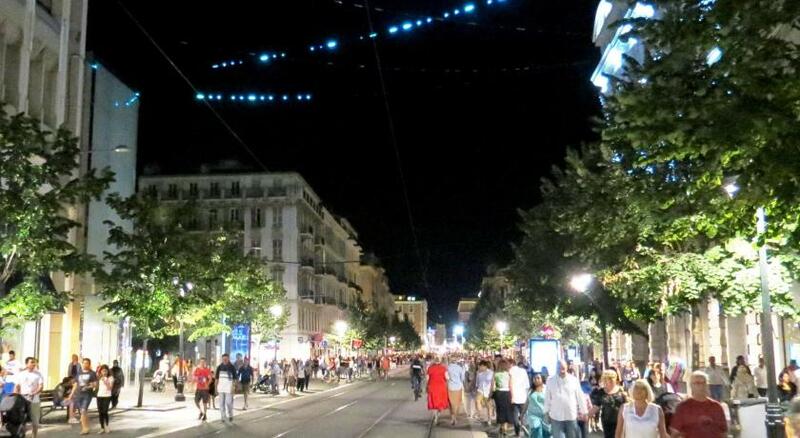 Hôtel Ellington is 0.6 mi from Nice's Old Town and 0.9 mi from Acropolis Congress Center. Nice Etoile Shopping Center is 800 feet away and Nice-Ville Train Station is 0.6 mi away. When would you like to stay at Hôtel Ellington Nice Centre? This more spacious room is air-conditioned and offers a contemporary décor, a flat-screen TV, a safety box, a mini-bar and a desk. The private bathroom has a bathtub, free toiletries and a hairdryer. Please note that this room can only accommodate 2 guests. This room is air-conditioned and offers a flat-screen TV, a safety box, a mini-bar and a desk. The private bathroom has a bathtub, free toiletries and a hairdryer. This spacious suite includes a Nespresso coffee machine and complimentary mineral water on arrival. It is is air-conditioned and offers a flat-screen TV, a safety box, a mini-bar and a desk. The private bathroom has a bathtub, free toiletries and a hairdryer. This room can accommodate up to 3 guests, upon prior request and subject to availability. The third guest will be accommodated in an extra bed and a EUR 40 extra fee per night is applicable. This suite includes a Nespresso coffee machine and complimentary mineral water on arrival. It is air-conditioned and offers a flat-screen TV, a safety box, a mini-bar and a desk. The private bathroom has a bathtub, free toiletries and a hairdryer. The third guest will be accommodated in an extra bed. Please note that this room can only accommodate 1 guest. Unique jazzy hotel on the French Riviera, the hotel Ellington**** Nice is perfectly located in the city center, only 5 minutes walking distance from the shopping area, the old town and the famous Promenade des Anglais. House Rules Hôtel Ellington Nice Centre takes special requests – add in the next step! Hôtel Ellington Nice Centre accepts these cards and reserves the right to temporarily hold an amount prior to arrival. Please note that the air conditioning is available from mid-May to mid-October. Guests are required to pay the total amount of their stay upon check-in. Please note that all children aged 17 and younger must be accompanied by an adult. Please note that a damages deposit of up to EUR 150 will be pre-authorized on your credit card before arrival. This will be used to cover any potential damages or extras taken at the hotel. Dirty room .no mattress protector! ! Unhygienic. Cracked windows . Dusty extractor fans. Keys didn't work . Saggy tired matresses. No recommend! !The bed sheet is so dirty , oil and hair on it. And when I ask for exchanging it, nobody does it for us . They just gave us the bed sheet and let us do the exchange by ourself. It’s not clean at all !!!! The environment is so bad. The only good thing is the location , not too far from the center and the seaside. But the worst thing !!!!!! is !!!! the mosquito . Which made me cannot sleep for even one minute . I live on the fourth floor and the mosquito annoyed me all the night. The room price totally cannot match to this bad environment.!!!! Service in the bar was slow. Small bathroom and noisy road outside - had to keep windows closed which was ok in April but would be an issue in summer as the room was already quite warm when we stayed. The hotel seems to cater for coach parties so the breakfast room and reception can be busy. The staff were not particularly friendly. The hotel is well located with easy access to the station, sea and old town. The breakfast is good with efficient service. Room needs renovation. It was nothing wrong with it but looks a bit old and not really on a 4star level. Location was great! Very close to everything. Staff was really nice and friendly. Large, clean, silent and comfortable room. close to the main popular places including train station. The lift s are very small and can get very busy. Had asked for double bed but got twins, as alone not too important. Had booked deluxe room but don’t think 610 was very deluxe, no robes or things like thsat. That the towels are washed even if you signalize that it’ s not needed. The purpose - sustainibility -is lost if the signal is not respected. Valet service was there untill 00.00 so it was not possible for us to give our car to the hotel. The staff were so friendly and helpful. The room was absolutely spotless and breakfast was so tasty! Excellent stay all round! The Hotel block on the credit card 100€ and it takes weeks to get it back. I don’t understand the reason why they can’t take 100€ cash if at all. The Hotel was in a great location within an easy walk to everything. It was clean & tidy & a great breakfast! I was somewhat miffed at how the temperature control system was a bit off. And I was constantly being baked in my room by the sun.